9:30 a.m. to 4 p.m.
During this two-day workshop, June 14-15, 2019, participants will learn how to create a seamless felted bag, pocketbook or clutch, using a felting technique around a resist. Participants will learn how to “shingle” wool, how to build layers with wool, in a form of roving or batt, and how to add pockets. 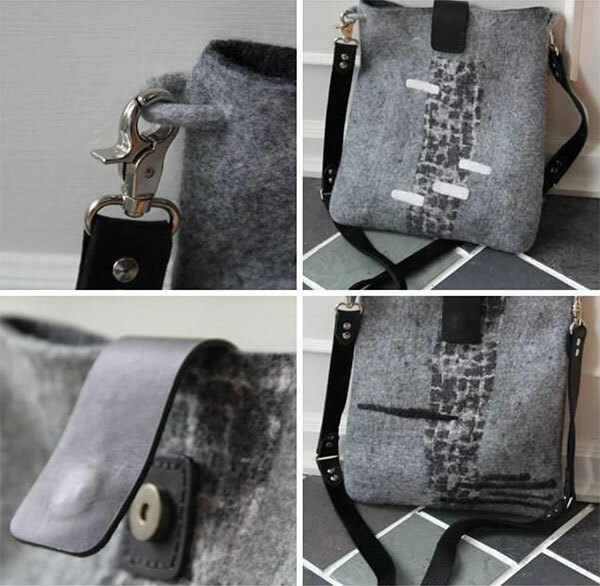 Before we start with the felting of the bag, there will also be an option to embellish it with pieces of silk fabric, yarn and other fibers such as silk fiber and bamboo. Instructor will demonstrate all the techniques, step by step, and participants will be given enough time to work on their own during the construction of the bag. Each participant will spend time with instructor to discuss design, color and composition. Upon completion, participants will learn different stitching techniques to embellish the bag, and each will have the option to add a leather strap and closure. Instructor will bring wool, roving and batt, silk fibers, bamboo and other embellishments that participants will be able to purchase by weight. Instructor will also supply leather straps and other hardware available for purchase. The cost of the leather straps will range between US$25-$75 with an exchange rate to Cnd $ at the time of purchase. Participants will be responsible for bringing the following materials. A detailed list will be sent to all registrants. 12 to16 oz wool (a combination of different breeds and different colors) or you may choose to purchase from instructor’s selection of wool. Check out Eva's website at https://evacamacho.com/ to see samples of her work. There are 12 spots available on a first come first serve basis. A waiting list will be created once the workshop is full by contacting Diane Arsenault at dearsenault@gmail.com . The work shop is open to Spirit of the Hills Members and Non-members. If we do not have 8 participants by May 10, we will cancel the workshop. You will be refunded in full if the workshop does not take place. If you cancel after that date, you will only be refunded your money if someone else is able to take your place and less the $25 cancellation fee. I will pay by PayPal using the payment option below I will pay by cheque and mail my registration form. "The Northumberland Hills Arts Association Inc."
If you require information on registration, please contact Diane Arsenault at dearsenault@gmail.com. If you wish to have a copy of your form, please click Print Form before hitting the Submit button.